The Knight Hoodie is now available! (You can get it by clicking here.) It's been so fun seeing all the versions made by my pattern testers. They seriously did a fantastic job!! The hoodie in the picture above was made by Tisha and I'm just in love with this dreamy white Knight! 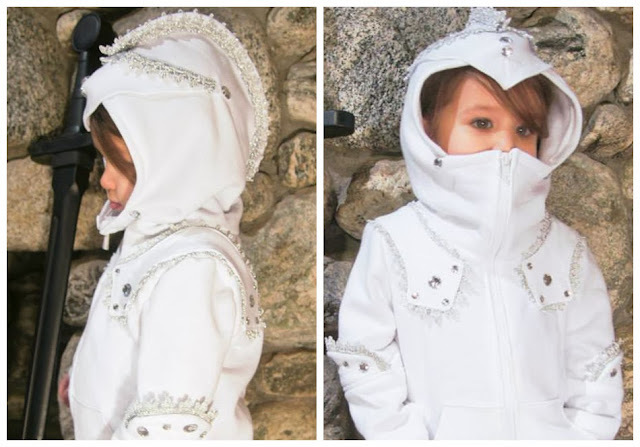 She used embellishments around all the armor and sparkly touches here and there to make it perfect for any little girl! I'm excited to share more of the tester versions with you (I shared some in this post too) as well as more details about the pattern to answer any questions you may have. Question: Can I sell hoodies I make with this pattern? Answer: YES! I love it when small shops can make something unique and fun and hope you will make LOTS of Knight Hoodies using this pattern! 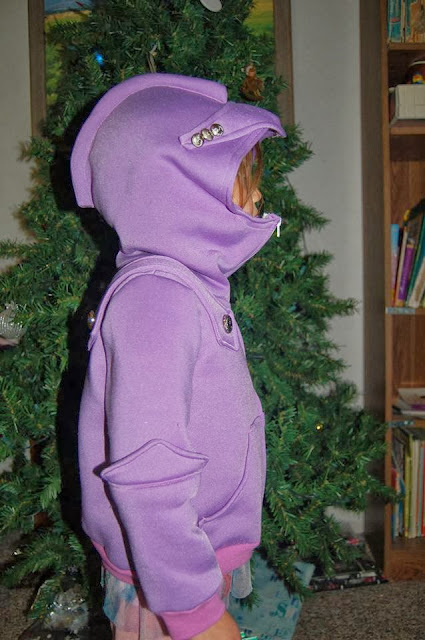 Question: Will this pattern be available in adult sizes? Answer: YES! I am working on tween and adult sizes right now and hope to release the extended sizes in the near future. Be sure to follow the blog or facebook page to get all the details. 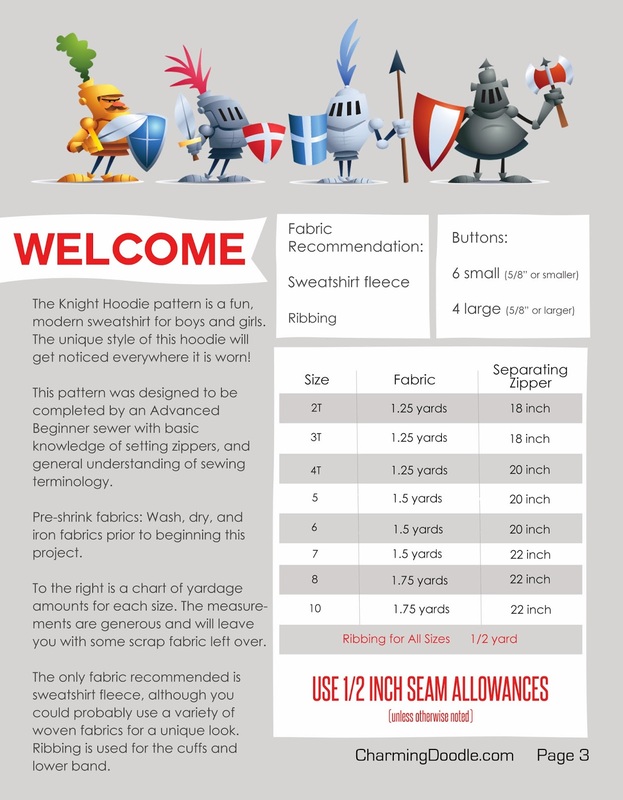 Question: What are the fabric requirements and size chart? Answer: See the images below for a little peek inside the pattern and see the fabric and size charts. 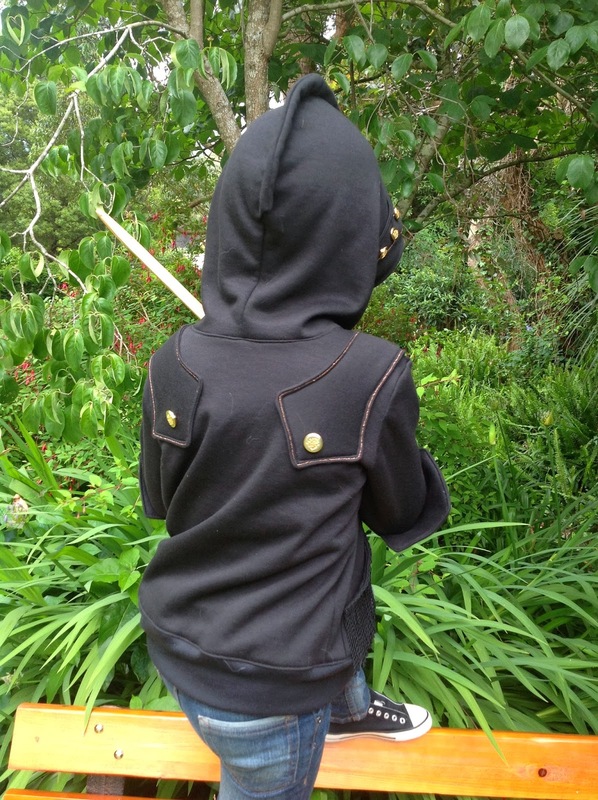 Now let's take a look at more of the amazing tester's Knight Hoodies! 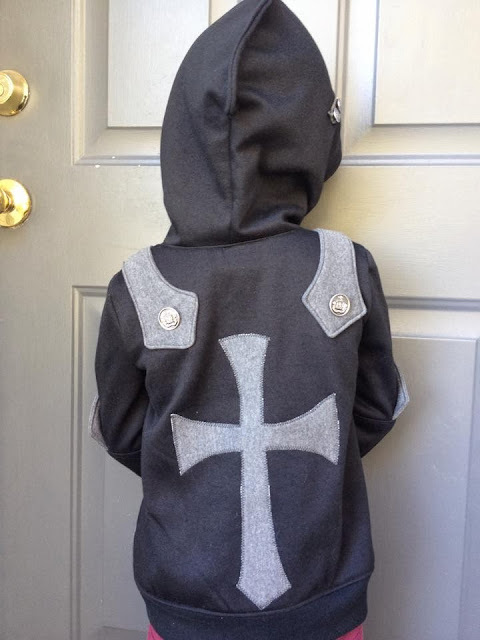 Danielle's son looks great in his hoodie and they even sent me a fun little video of him playing the part of a Knight, whipping his sword around and loving it! Renee from Nearest the Pin made this incredible red knight. I love how it turned out! You can visit her facebook page to see more of Renee's creative projects. Kim added this fantastic applique to the back. The applique isn't included in the pattern, but looks amazing! I love seeing the hoodie on a GIRL! There were several girl versions made by testers and this purple and pink version made by LeAndra is adorable! My girls both want one like this now! Melisa from Chase Me Photography tried the hoodie in wool instead of sweatshirt fleece and the result is incredible. Rachel did a great job with this gray hoodie. I love that zipper! 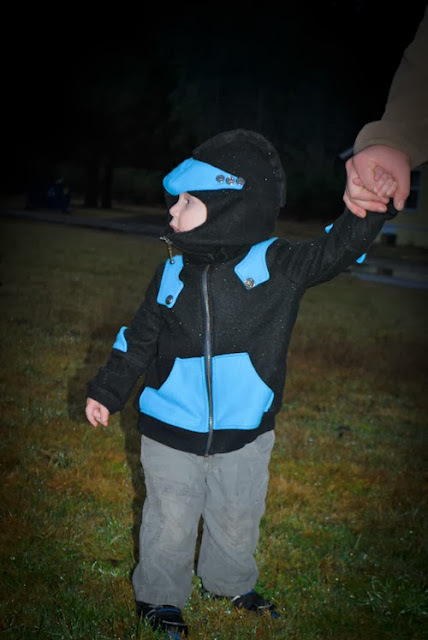 And since the zipper goes all the way up, a little one can really feel like a knight with his 'armor' on. 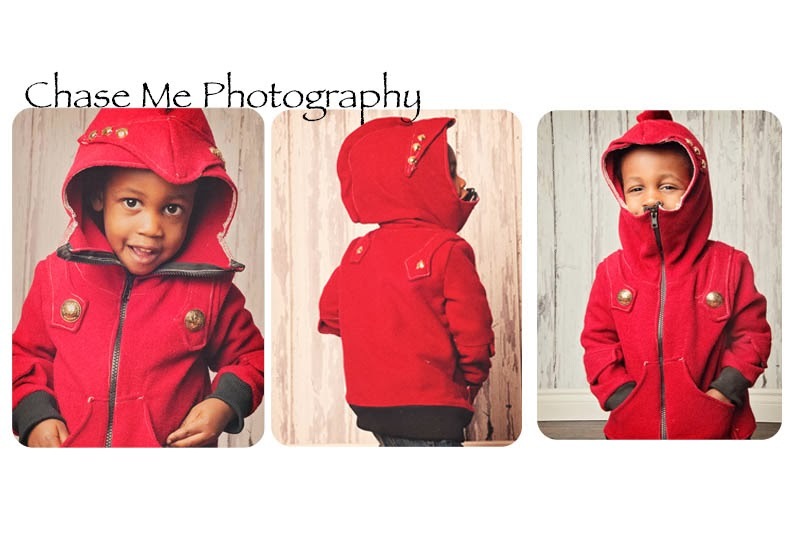 You can see more of Rachel's work on her Little Leela's Boutique page. Tanya made this hoodie for her adorable 2 year old grandson. I love the contrasting colors for the armor and pockets. I want to just say a huge THANK YOU to all these testers again. They helped refine the pattern and now that the pattern is released I can't wait to see your version too! Click here to purchase the pattern now! So many cool versions! Success, yay! 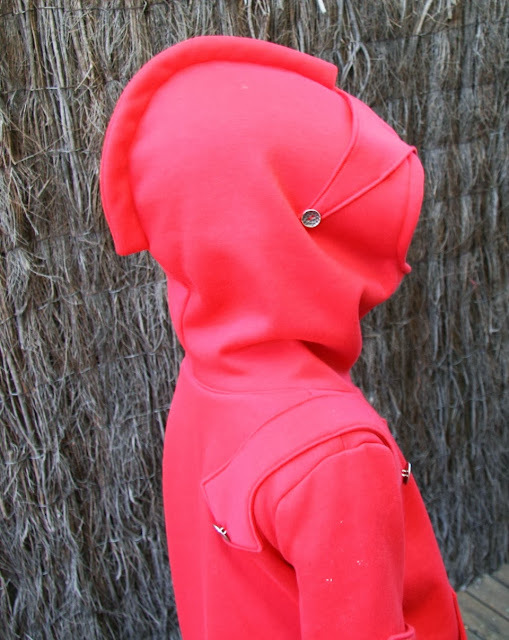 Where oh where can I order sweatshirt fabric suitable for this pattern online? Ideas? I don't live near a fabric store but bought the pattern when I fell in love...but now seem to not be able to track down the appropriate supplies. Thanks in advance! will the teen/adult sizes be available soon? Would it work with sofrshell fabric too? ?